The Canada Water Library located next to the Canada Water Basin in Southwark, London is an impressive new building designed to be the library of the future. Working with a small site on which to build, CZWG Architects came up with an ingenious plan to invert the building and expand floor space as it increases in height to provide the necessary square footage. The inverted shape is not only sculptural - it also has the benefit of shading the interior and creating a sheltered plaza at its base. Inside, the library is arranged to accommodate future growth and new digital media, and it provides lots of mixed-use spaces in which to study, interact and learn. 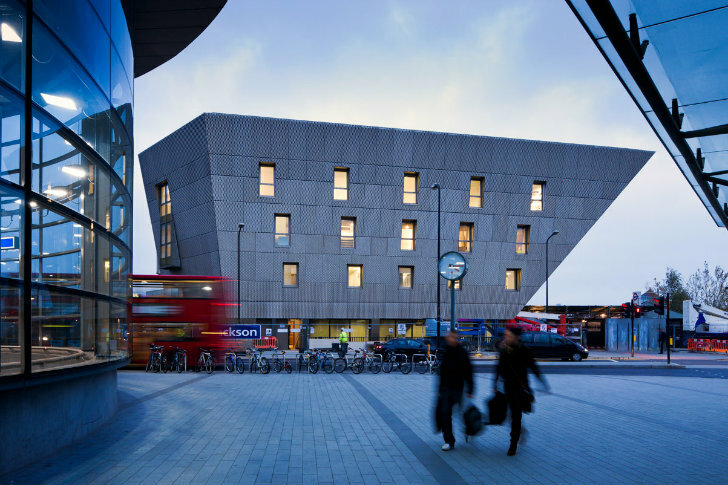 The Canada Water Library also makes use of energy-efficient technologies and it's capped off with a green sedum roof. The Canada Water Library by CZWG is part of a larger project to regenerate the area around the Canada Basin on the east side of London. With views over the water to the south, the library dominates the new public plaza and it’s conveniently located next to a tube station. A cafe on the ground floor of the plaza encourages people to enter the library and enjoy the facilities inside, which include an auditorium, a variety of study areas, and a large, open main library. The plaza was also designed to provide space for a farmers market, large TV screenings, festivals, and a host of other events and activities to make this library a truly multi-purpose space. The actual footprint of the building is limited, so to accommodate all the space that was necessary CZWG designed an inverted pyramid to provide more floor space on the upper levels. The auditorium makes use of this diagonal wall for its raked seating. As the walls expand on all sides, this creates natural shading especially on the south side where views are the best out over the water. This reduces solar heat gain, while still providing lots of natural daylighting. Meanwhile a central wood-paneled spiral staircase connects all the floors together and pulls natural daylight from the skylights into the heart of the building. The library also has excellent green credentials with a ground source heat pump, grey water harvesting and a green sedum roof that can be used for extra event space. The Canada Water Library by CZWG is part of a larger project to regenerate the area around the Canada Basin on the east side of London. With views over the water to the south, the library dominates the new public plaza and it's conveniently located next to a tube station. A cafe on the ground floor of the plaza encourages people to enter the library and enjoy the facilities inside, which include an auditorium, a variety of study areas, and a large, open main library. The library takes on a sculptural effect - it's clad in aluminum sheets that are anodized in a light bronze and perforated. The plaza was also designed to provide space for a farmers market, large TV screenings, festivals, and a host of other events and activities to make this library a truly multi-purpose space. The actual footprint of the building is limited, so to accommodate all the space that was necessary CZWG designed an inverted pyramid to provide more floor space on the upper levels. The auditorium makes use of this diagonal wall for its raked seating. As the walls expand on all sides, this creates natural shading especially on the south side where views are the best out over the water. This reduces solar heat gain, while still providing lots of natural daylighting. Meanwhile a central wood-paneled spiral staircase connects all the floors together and pulls natural daylight from the skylights into the heart of the building. The library also has excellent green credentials with a ground source heat pump, grey water harvesting and a green sedum roof that can be used for extra event space. CZWG also sought to ensure that the library will be able to transition through the years and adapt to future changes. 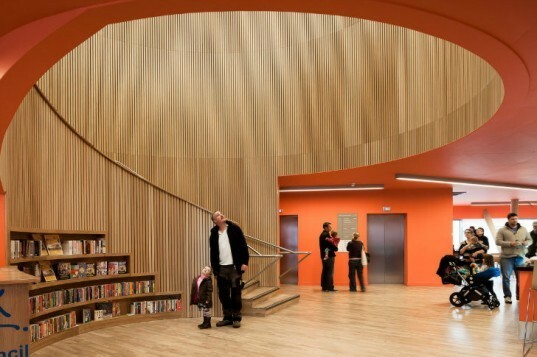 Councilor Peter John, leader of Southwark Council, said “Canada Water library truly is a library for the future. Designed to reflect the changing needs of library users, it is a wonderful and visionary statement of how Southwark values its libraries.